Abana reduces the sensitivity of the heart to adrenergic stimulation. Abana improves the contractility of the heart by exerting a positive inotropic action. Thus Abana produces cardioprotection. 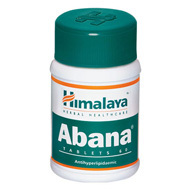 Abana is a cardiac tonic that protects the heart, guards against circulatory problems and wards off the fears and anxieties, which often lead to cardiac neurosis.